What is a Protective Relay? The Relay was invented more than 160 years ago. During the last 60 years, it has undergone considerable change, the most obvious of which is its reduction in size. A protective relay is a switchgear device that detects the fault and initiates the operation of the circuit breaker to isolate the defective element from the rest of the system. They are compact and self-contained devices which can detect abnormal conditions. Protective relays detect the abnormal conditions in the electrical circuits by constantly measuring the electrical quantities which are different under normal and fault conditions. The electrical quantities which may change under fault conditions are voltage, current, frequency, and phase angle. Through the changes in one or more of these quantities, the faults signal their presence, type, and location to the protective relays. Having detected the fault, the relay operates to close the trip circuit of the breaker. This results in the opening of the breaker and disconnection of the faulty circuit. The protective relaying is used to give an alarm or to cause prompt removal of any element of the power system from service when that element behaves abnormally. The protective relaying scheme includes protective current transformers, voltage transformers, protective relays, time delay relays, auxiliary relays, secondary circuits, trip circuits etc. Each component plays its own role, which is very important in the overall operation of the scheme. The protective relaying is the teamwork of all these components. The protective relaying also provides the indication of location and type of the fault. A typical relay circuit is shown in the figure below. This diagram shows one phase of a 3-phase system for simplicity. The relay circuit connections can be divided into three parts viz. First part is the primary winding of a current transformer (C.T.) which is connected in series with the line to be protected. The second part consists of the secondary winding of the current transformer and circuit breaker and the relay operating coil. The third part is the tripping circuit which may be either Ac or DC. It consists of a source of supply, the trip coil of the circuit breaker and the relay stationary contacts. The working of an electrical relay based on the above diagram is explained below. When a short circuit occurs at point F on the transmission line, the current flowing in the line increases to an enormous value. 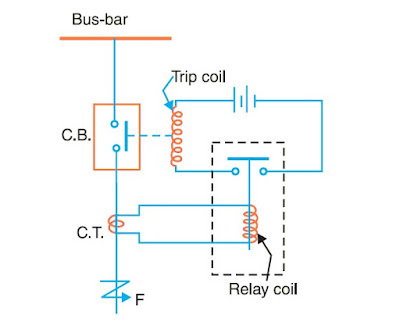 This results in a heavy current flow through the relay coil, causing the relay to operate by closing its contacts. In turn, closes the trip circuit of the breaker, making the circuit breaker open and isolating the faulty section from the rest of the system. This way, the relay ensures the safety of the circuit equipment from damage and normal working of the healthy portion of the system. The principal function of protective relaying is to cause the prompt removal front service of any element of the power system when it starts to operate in an abnormal manner or interfere with the effective operation of the rest of the system. Read more about each of them at the Fundamental Characteristics and Functional Requirements of protective relaying. Most of the relays in service on electric power system today are of the electromechanical type. 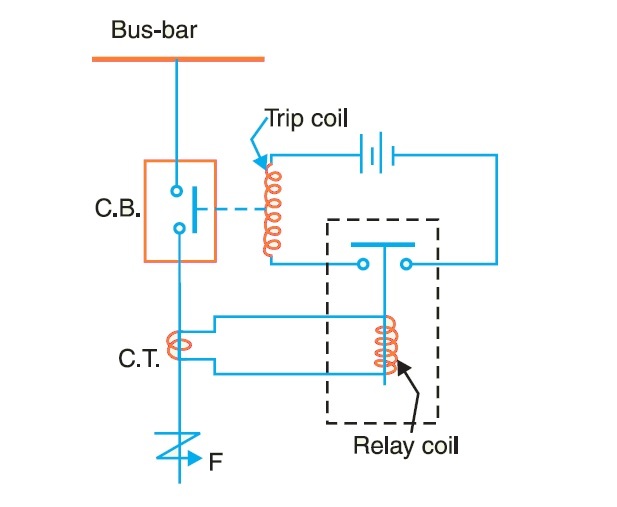 Electromagnetic attraction relays operate by virtue of an armature being attracted to the poles of an electromagnet or a plunger being drawn into a solenoid. Such relays may be actuated by d.c. or a.c. quantities. Electromagnetic induction relays operate on the principle of the induction motor and are widely used for protective relaying purposes involving a.c. quantities. They are not used with dc quantities owing to the principle of operation. The prompt removal of the component which is behaving abnormally by closing the trip circuit of the circuit breaker or to sound an alarm. Disconnect the abnormally operating part so as to avoid the damage or interference within the effective operation of the rest of the system. Prevent the subsequent faults by disconnecting the abnormally operating part. Disconnect the faulty part as quickly as possible so as to minimize the damage to the faulty part itself. For example, if there is a winding fault in a machine and if it persists for a long time then there is a possibility of the damage of the entire winding. As against this, if it is disconnected quickly then only a few coils may get damaged instead of the entire winding. Restrict the spreading of the effect of the fault causing the least interference to the rest of the healthy system. Thus by disconnecting the faulty part, the fault effects get localized. To improve system performance, system reliability, system stability, and service continuity. The faults cannot be completely avoided but can be minimized. Thus the protective relaying plays an important role in sensing the faults, minimizing the effects of faults and minimizing the damage due to the faults.